Megan Delmar, the executive director of Staten Island Recreational Association, Inc., in Staten Island, NY, sent a letter to PATH Intl. thanking members for the assistance provided through the PATH Intl. Disaster Relief Fund. Read the full letter here. "I don't think I was mentally ready to handle what was ahead for us and I was a little broken," Megan writes. Then two boys, both on the autism spectrum and one a former participant, came to help in any way they could. "Watching these two boys work so hard trying to make a difference with their own limited abilities brought me right back to where I needed to be. ... I was ready to rebuild what I lost. I thought of all the kids we have helped over the years. How we had given them a place where they were accepted and belonged. A place where they could go and their disability didn't matter. It was in that moment that I asked our instructor to contact PATH Intl. for help." Questions about registration? Contact Karen Province or call her at (800) 369-7433, ext. 111. Everyone is looking for ways to diversify programming and increase revenue. Create an inclusive trail riding team! Presenters Teri Carroll and Doria Fleisher will show attendees how to add team trail riding to a program while attracting new participants and providing individuals of varying abilities the opportunity to ride together. More and more, research is being sought for the efficacy of equine-assisted activities and therapies. Prepare your EAAT center for research with this session, which highlights issues to consider for developing quality research, including infrastructure and collaboration. This session, based in part on a collaboration between a center and a university research team, is presented by Robin Gabriels and Amy Shoffner. You work hard throughout the year. You need a vacation! PATH Intl. has just the thing you need to turn your 2013 PATH Intl. Conference and Annual Meeting into a great vacation. Click here for ways to extend your time in Orlando by buying discount tickets for Orlando attractions, such as Disney theme parks, by making reservations through an exclusive PATH Intl. partnership, or by participating in the PATH Intl. Destination Vacation Online Auction. Have fun! 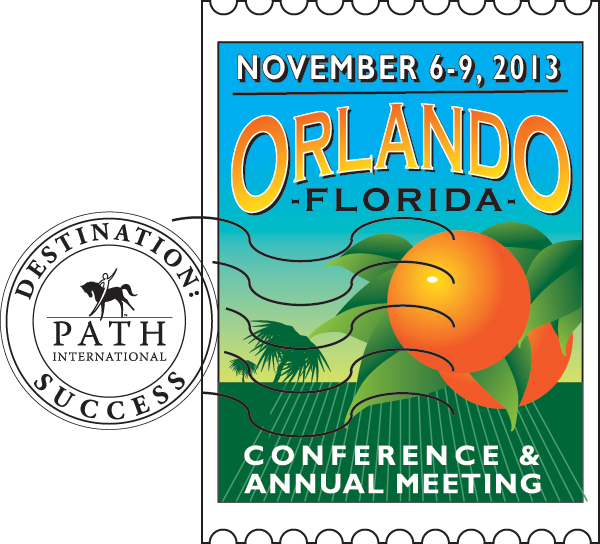 Congratulations to the following, who are the recipients of the PATH Intl. Conference Scholarships! Thank you to all of those who took a good deal of time to apply and weren't selected. Please apply again next year for the 2014 conference. Strides to Success, a PATH Intl. Premier Accredited Center in Plainfield, IN, was featured in an article in The Indianapolis Star June 23 titled "The Horse Is the Whisperer" by Phil Richards. The story focused on the veterans program at the center. One veteran, Doug McLaughlin, is using sessions to help him deal with post-traumatic stress disorder. Sessions have been healing. "What's the magic? That's a good question," he told Richards. "The horse senses there's a leader in everyone. You've just got to find it." Congratulations to Strides to Success for furthering the attention of the benefits of equine-assisted activities and therapies to those who face challenges. EFL is a rapidly growing part of the equine-assisted activities and therapies industry that is large and sometimes ambiguous as far as definitions, practices and professional pathways. A survey has been created that will help PATH Intl. as an association better understand the needs of its members, and the information gathered will help guide us as this industry evolves. For taking part in the survey, one member will receive an EFL package, which includes the PATH Intl. Equine-Facilitated Learning Manual, a PATH Intl. ESMHL Certified Professional shirt and Marvelous Minis curriculum donated by Strides to Success, a PATH Intl. Premier Accredited Center in Plainfield, IN. Winner to be drawn randomly. PATH Intl. will hold the webinar "Riding in the Moment: A Program for Persons With Alzheimer's Disease and Other Forms of Dementia" on August 21, 2013, at 5 p.m. Mountain time. It will be presented by Stef Vikora, Program Director at Hearts and Horses, a PATH Intl. Premier Accredited Center in Loveland, CO. If you would like to attend this pertinent and informative topic, contact Denise Fager or call her at (800) 369-7433, ext. 114. Please join PATH Intl. in welcoming these new centers. These centers joined PATH Intl. in July. Be sure to check out the summer issue of PATH Intl. Strides magazine's "Great Idea" on page 50. Lynn Petr discusses the profitability of composting. The system she uses, O2 Compost, was a PATH Intl. 2012 Conference exhibitor. O2 Compost is offering discounts to PATH Intl. members who purchase its systems through August 31, 2013. The Parelli Education Institute, a nonprofit dedicated to the teaching of natural horsemanship, is giving away $1,000,000 in educational materials to therapeutic horsemanship centers, horse welfare organizations, youth programs and individual youth under age 19. Click here for information and to apply for the grant, which is made possible by Parelli Natural Horsemanship. The giveaway ends November 15, 2013. Help PATH Intl. and possibly win a prize by taking 10 minutes or less to tell us about your purchasing habits. In order to serve our members best, we seek to partner with appropriate industry organizations and companies. So every couple years PATH Intl. gathers purchasing data on its membership to help us align with those organizations.